But beware. Too many detours and too many redirects are just what the redirects monster is hoping for! The 301 redirect (“moved permanently”) is most frequently used. It communicates to the Googlebot: “Contents that were to be found in this place have been permanently moved” – to a new domain or another URL. Thus, as with the 302 redirect, the advantage of the 301 redirect lies in the fact that the referring links are passed on. The more valuable links your site has, the more important this is for a continually good ranking. This is important, for example, when a shop item has been removed – without a redirect, a 404 error site will be generated. Search engines follow status codes blindly and they need your changes in status code in order to be able crawl your site anew. This accelerates the indexing process. Nevertheless, when websites are redirected multiple times, this is a sign that the redirects monster has taken over your website. This then influences the loading time, and annoyed readers will find the desired information only via detours. Put the monster in its place by not redirecting URLs more than once. Your .htaccess File – Guaranteed Monster-Proof! Ideally, you would solve the redirect problem in the .htaccess file. This configuration file is stored as a text document in the main directory, thus on the same level as the index.php or index.htm sites. In this file, you can create settings for the domain and sub-directories and introduce detours. RewriteRule -> “Redirect from site A to site B”. 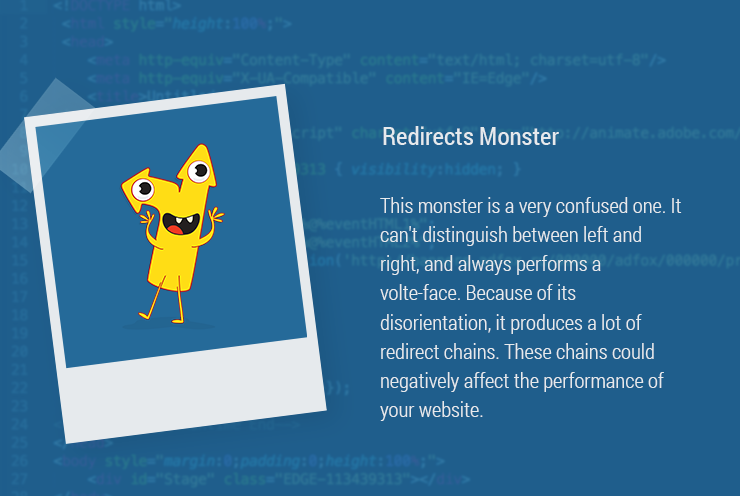 If you suspect that the redirects monster could be on your website, Ryte can help you. You can check whether your configured redirects are functioning and whether the .htaccess is correctly programmed. Here you will learn whether there are syntax errors or whether you have loaded the file in the correct directory. You will also learn whether the rules on file relate to the desired directory and whether the correct type of redirecting is given. In Ryte’s module Website Success, under “Indexability,” click on “Redirects” and then on “Status Codes.” Here, you have a clear overview of your redirects. To see a list of each different type of redirect, click on the respective box. After changes to your URL structure or for a relaunch, the 301 redirect via .htaccess is an optimal way to avoid losing traffic and to transmit valuable links. Users are reliably forwarded from the old URL to the new URL, and search engines know that the content can be found under a new address. In this way, the new sites are indexed more quickly by Google and the old ones removed. If you regularly check your website with Ryte after making any necessary changes, you will defeat the redirects monster. Published on 07/05/2017 by Kathrin Schubert.